Change doesn’t have to be a harrowing experience when you have an expert to lead the way. Enterprises now have technologies available to help them effectively address the changes driven by an ever-evolving landscape, particularly with respect to the significant efficiencies robotic process automation (RPA) can bring to several areas of an organization -- financial statements, IT, and internal auditing being towards the top of the list. As we all know, however, even the most revelatory of innovations can still be met with consternation if they involve a nudge outside of our comfort zone. If any of this sounds familiar, then you’re likely aware of the tremendous value RPA can add to your enterprise, but still can’t quite seem to dive into the automation pool. Maybe you’re nervous about the change it will bring to your company. Or maybe you already tried to implement RPA in the past and had a rough experience. No matter the case, Embark assures you those automation waters are as warm and inviting as you suspect, as long as you rely on expertise and experience to help you get the most from your bots. 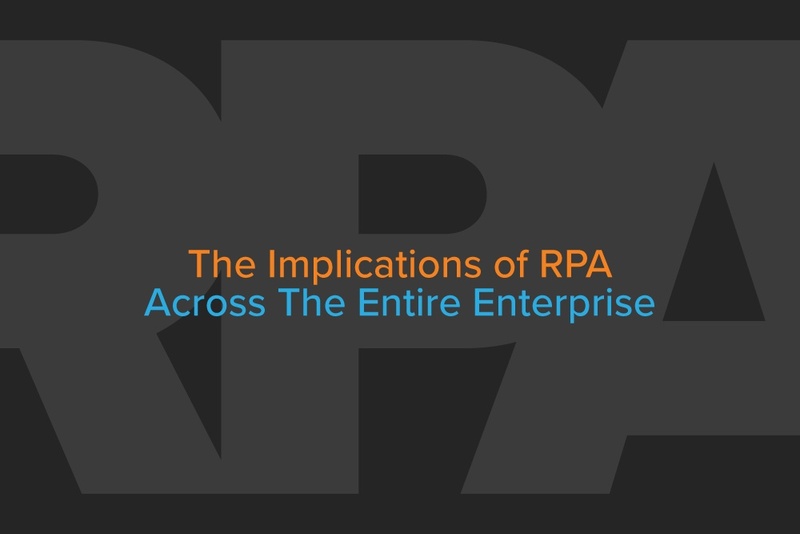 Give Embark a few moments of your time as we discuss the implications of RPA across your entire enterprise. Departments, individuals, and processes that work behind the scenes, further along the transactional pipeline, might not get the glory of their sales team counterparts but are just as vital to an organization's success. These downstream departments and functions -- think of a transactional river flowing from its sales-driven headwaters -- are often mired in numerous tasks that are equal parts vital and laborious to the enterprise. IT, internal audit, and financial reporting are three of the best examples demonstrating this notion, downstream within the transactional flow of the enterprise and already charter members of an organization’s RPA environment. RPA can play an essential role in each, quickly ramped up while adding significant value along the way. Let’s take a closer look at how RPA -- once your enterprise and processes are carefully examined and bots designed for your specific needs -- impacts these three examples. Whether you deploy a single bot or a small army of them, they will inevitably affect your IT infrastructure. Since each bot will be handling a portion of the workload previously assigned to a team member, bots are users within your systems and will need appropriate access and permissions. Remember, as useful as bots are to your enterprise, they can’t communicate or pull information from thin air but need to interact with your systems and server data to function. Naturally, your IT department needs to be fully up to speed at all times regarding your RPA plans and deployment to keep systems stable, secure, and smooth. There’s nothing like a clean and conspicuous audit trail to put a smile on your internal auditor’s face. Those trails help your auditor keep your company in compliance and ensure everything is in its proper place and working as it should. RPA excels in helping develop and maintain those robust audit trails, primarily by logging every bot task to make the process completely transparent and traceable. If something were to go wrong, the auditor would be able to identify and source the issue quickly. Of course, internal auditors must be roped into the RPA processes and have a solid understanding of what they do, how they do it, and where they fit into the overall enterprise. While an internal auditor doesn’t need to become an expert on bots and RPA technology, they must be comfortable enough to identify when automated processes go awry. Although RPA’s impact on financial reporting isn’t as direct as it is with your IT and internal audit, a definite cause-and-effect still exists between the two. To that point, RPA’s effect on financial reporting is more difficult to quantify as it’s your accountants that have the most insight into the controls that feed into your financial statements. However, given those insights, it’s imperative that your accounting team maintains constant and thorough oversight of the bots to ensure all of the automated processes are functioning correctly, and the data used throughout is accurate and complete. Substituting team members with bots will also have a significant impact on the P&L, a concept that is very much within the jurisdiction of your accountants and financial statements. The value RPA can bring to the enterprise through reduced labor costs and, just a bit further down the road, increased efficiency and innovation once those team members are reassigned to other responsibilities, will undoubtedly shine through on your financials. While these might only be a handful of examples, they collectively demonstrate the fertile RPA ground already in place within a typical organization, particularly in downstream operations. However, the technology is only as good as an enterprise effectively implements it. Fortunately, you already happen to know a group of people with absolute expertise and the experience needed to help you draw the most from RPA. Sure, we’re not being too subtle about it right now, but that’s okay. Contact Embark. Let us work our RPA magic for your enterprise. We promise it’ll be one of the best decisions you ever make.